Founded in 1131 by Water de Clare, Tintern was to become the wealthiest abbey in Wales, owning many estates. The monastic buildings were not finished until the 1340s. After the house was dissolved in the 16th century, the abbey fell into disrepair and gradually became the romantic ruin so admired by eighteenth century travellers. 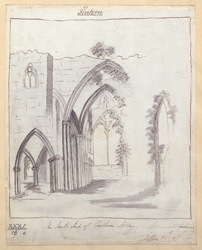 Although the interior of the church had been "cleaned up" by the owner, the Duke of Beaufort, in an effort to make it look more picturesque, its wildness and natural beauty was still apparent. As can be seen in the picture, the interior of the church was particularly interesting, with ivy-clad crumbling walls, and foliage covering gothic archways.